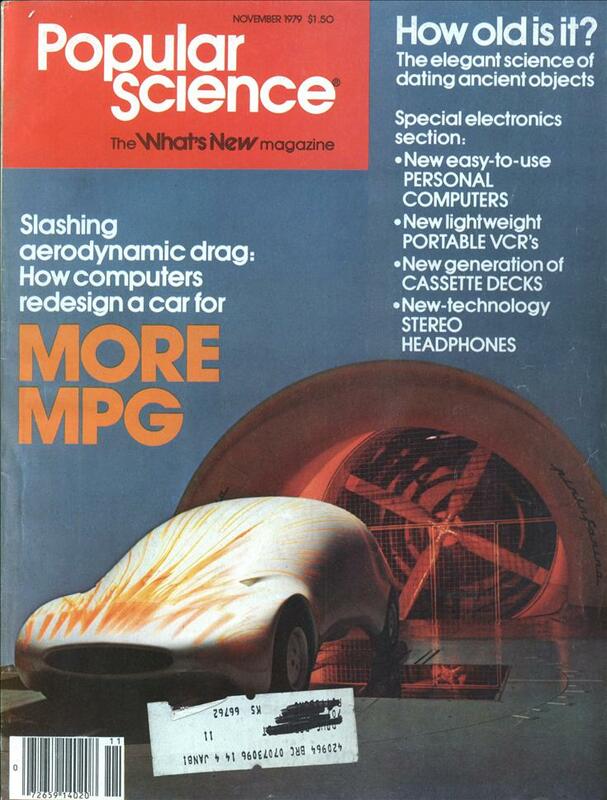 It’s the same computer shown on the cover and inside article of the March 79 Popular Science and also featured in a Fall 78 Video Magazine article! 10,000 transistors, on a pure silicon wafer half the size of your fingernail, perform 500,000 instructions PER SECOND! Using pre-programmed cartridges, VideoBrain can perform a wide variety of functions! FOR YOU! VideoBrain can quickly do difficult calculations; store data in memory; help analyze household expenses, investments, taxes, etc. It can even receive valuable data from business computers, nationwide, through your phone! FOR YOUR CHILDREN! Learning is fun with VideoBrain. TV display encourages them to increase abilities in music, math, typing, spelling, etc. FOR ENTIRE FAMILY! VideoBrain provides unending hours of fun and excitement with a wide variety of fascinating video games! Expander I: Lets you use ordinary audio cassette recorders for memory to store programs or data. FREE! 3 Cartridges With Computer! Vice Versa: Modern version of fascinating Oriental game of “Go” with choice of clever TV opponents to beat. A $30.00 value, yours FREE! Music Teacher: Learn to read and write music! Compose your own tunes on TV . . . VideoBrain plays them back! A $24.00 value, yours FREE! Wordwise 1: Builds vocabulary and spelling skills with a challenging word game on TV. A $24.00 value, yours FREE! Additional Cartridges, at 1/2 Price! (See descriptions in Order Form.) IMPORTANT! Orders for additional cartridges MUST be placed NOW because we plan to liquidate all excess cartridges to dealers immediately after this sales promotion is through! CPU: F-8 microprocesor, 8 bit. Memory: 1K byte RAM. 4K byte ROM. Inputs: 36-key keyboard with 71 input symbols; 2 joysticks (can accommodate up to 4 joysticks); cartridge programs with 2K to 8K memory. Outputs: Standard TV signal (RF) including 16 colors and sound; receivable on channel 3 or 4. Expansion socket: Includes lines for data transmission, reset, interrupts, bidirectional sound, power for add-ons. Power: 120V AC, 10 watts typical power consumption. Regular $24.00 cartridges. NOW only $12.00 each: Wordwise 2: Teaches typing with 3 exercises for beginning typists. Includes “Cypher” word game. Video Artist: Create original designs in 16 colors. Quadruple into a kaleidescope; put in motion! Regular $30.00 cartridges. NOW only $15.00 each. Math Tutor 1: Makes learning fun! Student works out arithmetic problems on TV screen. Lemonade Stand: Simulates a small business to teach basic business management. Regular $24.00 cartridges. NOW only $12.00 each. Pinball: For pinball fanatics! Has exciting color, movement and sound. Blackjack: One or two players try to beat dealer in card-style game. Gladiator: 384 action-packed games in versions for ancient, modern or future warriors! Tennis: Like the real thing with fast movement and realistic players, spectators, animated ballboy! Checkers: The ever-popular game of strategy with 4 computer opponents of varying degrees of skill. Expander 1: Lets you use low cost audio cassette recorders for memory data storage. Regular $ 170.00. NOW only $85.00! Timeshare: Allows you to access data of timeshare computers across the nation by phone. Used with Expander 1 and Audio Modem described in ad. Regular $80.00. NOW only $40.00! Money Minder: To record, analyze expenses for money management. Uses Expander 1. Regular $80.00. NOW only $40.00! Financier: For personal financial use and general household calculations. Regular $70.00. NOW only $35.00! Mastercharge & VISA only; Phone your order Toll-Free. PUBLIC NOTICE! BANKRUPTCY and Financially Distressed Merchandise! If your company finds itself in any of the situations listed above and is forced to sell large inventories for immediate cash, call us. Only products in perfect operating condition (or slight blemishes that do not affect operating efficiency) will be considered. American Made! Comes With 1 Year Warranty! Wolfram|Alpha says that $164 in 1979 dollars is about $499 in 2011 dollars. So this would compare (poorly) to an iPad or a netbook these days. More interesting: $45 (in today’s money) for “Lemonade Stand”. It seems to have been poorly designed and badly marketed. Of course, one disadvantage to buying end-of-line material that could have been foreseen even in 1979 is that nobody would ever write any more software for it. I don’t know if the average home user would have seen that as a major drawback. The concept of constant upgrading simply wasn’t in even computer enthusiasts’ minds yet. A computer was seen more like a TV – you used the same one for ten or fifteen years. And what would they want with new software anyway? @Charlene: You either didn’t own/use a computer back then, or you mis-remember your history. Upgrading your computer (hardware and software) has and always will be “the thing to do” (otherwise, the two venerable magazines of the small home computer era – Byte Magazine and Computer Shopper – wouldn’t have had any reason to exist). There was always something new to add to your machine (favorite “luxuries” were a speech synthesizer and/or a robot arm – though in the 1970’s, a favorite for certain machine was a graphics card!). @Stephen: For this machine, maybe, but if you picked the right machine at EOL, while you wouldn’t see much new software or hardware, you might see some. For instance, there are several 8-bit machines from the 1970s and 1980s that people still release new software and hardware for to extend their capabilities. All of it is small, somewhat “homebrew” (but with today’s fabrication shops, you’d be hard-pressed to tell in some cases), some is “free”, some you have to pay for. 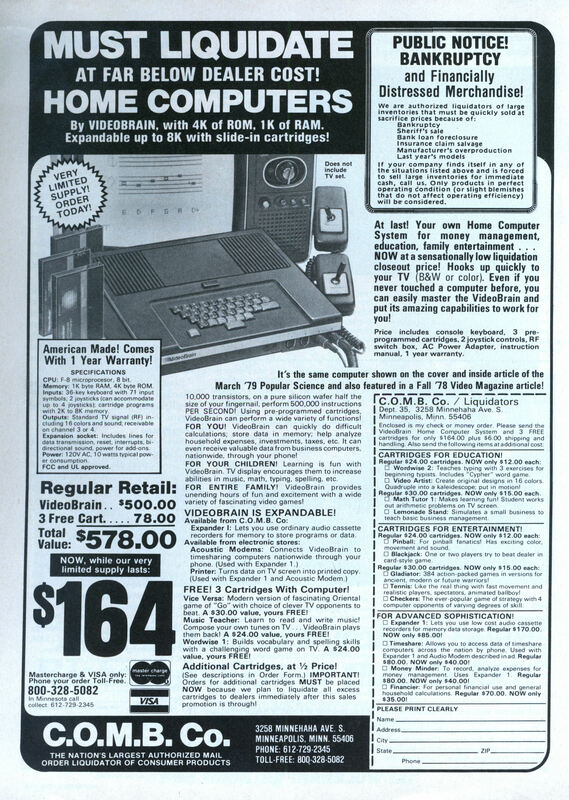 The computer from my youth (TRS-80 Color Computer) still has people making both hardware and software for it (as well as cross-compilation utilities and such for developers), plus an active emulation following. Another computer that has a huge following, and recently there was released a mini-clone, as well as a full-sized reproduction kit – is the Altair 8800; I’m sure if such kit is being released for sale, then software is also probably available (then there’s tons of stuff for the C=64, Atari machines, Amiga, etc). So EOL machines aren’t necessarily “dead” – it just depends on how popular they originally were to begin with. Then again, I don’t discount plain nostalgia, but that also is part of the original popularity – from looking at it and reading the Wikipedia article, the VideoBrain seemed stillborn at release. Nothing could save it, unfortunately (I own a similar machine that was made by Tomy; although it was more popular in Japan than here in the USA – and it was actually well designed, for the most part). Yes, I recall having to almost physically restrain a few relatives from buying TI-99/4a machines when they were being liquidate, but that was partially because I didn’t want to become tech support for them all. I’d actually been using them as cheap graphics/speech terminals attached to a 32bit supermini and quite enjoyed them. But even Bill Cosby as spokesperson couldn’t save them. A no-name like this didn’t stand a chance. Andrew L. Ayers: Wow! Bill Cosby as the Ti-99 pitchman? I’d completely forgotten about that. Found this online. Time frame indicated by the offer expiring 15 April 1983. Found this one too. I mean, Bill Cosby? Hey I had a TI-99 they were not that bad for their day. My first computer was technicaly a calculator, an HP-41CV . The Ti-99 came next. I had a lot of fun learning to program sprite graphics with it. Computer Shopper magazine… heh. I remember when if you dropped an issue it might break your foot it was so big. There was a C.O.M.B. store here in Rochester MN a few years after that. It was always fun to go there and see what kind of junque they had; the stock rotated often . . . . I think that was true for enthusiasts, but for general geeks who were (like my family) buying their first computers in the late 70s and early 80s? Less so. I think they were open to tinkering, sure, but the idea of the yearly upgrade didn’t exist.